Ab-secreting cell (ASC) expansion and survival are important processes in optimizing vaccines and controlling autoimmunity. The microenvironment of the medullary cords is positioned to control these key processes. Previously, we imaged and characterized ASC differentiation and migration by intravital microscopy in the lymph node (LN) by transferring and activating B cells expressing yellow fluorescent protein only in the ASC compartment. In this study, we observed that yellow fluorescent protein+ ASCs in the medullary cords migrated along myelomonocytic cells and arrested in contact with them. Acute ablation of myeloid cells using the human diphtheria receptor system (diphtheria toxin receptor [DTR]) expressed in Lysmd1-cre–positive cells increased ASC and Ab production by 2-fold. Increases in ASC numbers were associated with cell proliferation based on Ki-67 staining, rather than reduced apoptosis, or changes in egress from the LN. Using DTR-mediated ablation targeted to Ccr2-expressing myeloid cells also generated increases in ASCs. In contrast, neither the depletion of Gr-1–positive cells with an Ab nor the ablation of cells using a cd11c-DTR resulted in any change in ASCs. IL-6 cytokine signaling can enhance ASC production and has been implicated in dampening ASCs in lupus mouse models through myeloid cells. Using mixed bone marrow chimeras, we observed that IL-6 enhances ASC production, but IL-6 production was not required by myeloid cells to dampen ASCs in the LN. Inhibition of ASCs by these myeloid cells in the LN provides a new regulatory mechanism with implications for tuning Ab responses. Effective and long-lived Ab production in the body is dependent on the generation and survival of plasma cells (PCs). This process involves a multistep differentiation program, cell–cell interactions, and migration through several anatomical niches that facilitate each stage (1, 2). In the lymph node (LN), plasmablasts (PBs), precursors of the PCs, are produced following Ag exposure, in the first few days at extrafollicular regions and within germinal centers at later stages of the response. PBs migrate and accumulate in the medullary cords of the LN, with some PBs exiting and homing to other tissues such as the spleen and bone marrow (BM). Although reductions in motility and proliferation tend to correlate with differentiation of PB to PC, this transition is not sharply defined but rather a continuum. Both a PC and a PB can be described as an Ab-secreting cell (ASC) that expresses high levels of Blimp1 protein, encoded by the Prdm1 gene. Previously, we characterized ASC migration in the LN by tracking cells expressing yellow fluorescent protein (YFP) under the control of Prdm1 promoter by imaging using two-photon microscopy and observed that both early- and late-forming cells migrate rapidly, in a nondirected but highly linear random sprint, eventually arresting in the medullary cords (3). We detected a correlation between reduced cell migration and the differentiation state of the ASC in vivo and in vitro on an ICAM-1–coated substrate. We concluded that there was a cell-autonomous component to arrest in the medullary cords. However, we did not assess the role of other medullary cord cells on ASC arrest or any functional role for ASC physiology. These auxiliary cells are often referred to as niche cells, and seem to vary in a tissue-specific manner (1). Many cell types have been implicated in ASC differentiation and survival that are tissue and species specific. For example, within the BM, stromal cells, megakaryocytes, eosinophils, dendritic cells (DCs), neutrophils, and other cell types have all been assigned a functional role, many based on colocalization studies (1). In the LN, MacLennan and colleagues (4) used immunohistochemistry to identify and catalog cells that neighbor ASCs during their migration and differentiation in the mouse LN. They detected ASCs juxtaposed to DCs in the T cell zone, and with neutrophils, monocytes, and macrophages in the medullary cords, as well as subcapsular sinus macrophages. Based on the high expression of IL-6 and APRIL transcripts in these myeloid cells, they proposed that these cells may provide a niche for ASC differentiation and survival. These correlative studies provide hints at important cell niches, but call attention to the need for direct studies to test these hypotheses. It can be difficult to distinguish which cell contacts are important based on thin-section histology of lymphoid tissues, due to a crowded microenvironment full of an assortment of cell types. Some cells are dynamic and may only contact PCs briefly in passing. In this study, we extend these observations using intravital imaging to visualize the duration of cell–cell interactions. This technology provides the ability to distinguish transient from stable interactions as well as observe cell contacts in an intact volume, which provides important contextual information that is obscured in thin sections. We also used a variety of depletion techniques to target different myeloid subsets to directly assess what functional roles they play in ASC differentiation and Ab production. For most experiments, C57BL/6 (B6) or congenic CD45.1+ (so-called B6.SJL) mice were used as recipients (from Taconic or Charles River). CCR2-diphtheria toxin (DT) receptor (DTR) mice were provided by E. Pamer (Memorial Sloan-Kettering Cancer Center, New York, NY); LysM-GFP+ mice were a gift of T. Graf (Center for Genomic Regulation, Barcelona, Spain). LysM-cre, iDTR, cyan fluorescent protein (CFP), tdTomato, CD11c-DTR, and Blimp1-YFP, IL-6−/− mouse strains are available from The Jackson Laboratory. To generate Ag-specific ASCs, recipient mice were immunized by i.p. injection with OVA (50 μg) emulsified in alum (Pierce) to generate abundant T cell help. After 2–4 wk, mice received i.v. adoptive transfer of ∼3 × 106 naive B18-high+/− Blimp1-YFP+ B cells that were purified by negative selection using CD43-depletion kit (Miltenyi Biotec). The following day, mice were boosted with 50 μg/mouse nitrophenyl (NP)-conjugated OVA (NP-OVA; Biosearch Tech) by s.c. injections distributed into the footpads, handpads, and base of the tail to target draining LN. Mice were sacrificed on day 7 for flow cytometry analysis of the draining LN (popliteal, inguinal, axillary, and brachial), spleen, and BM from hind leg bones. For DTR depletion experiments, mice were treated with an i.v. injection of diphtheria toxin (1 μg in 100 μL PBS) on days 4 and 6 after boost. 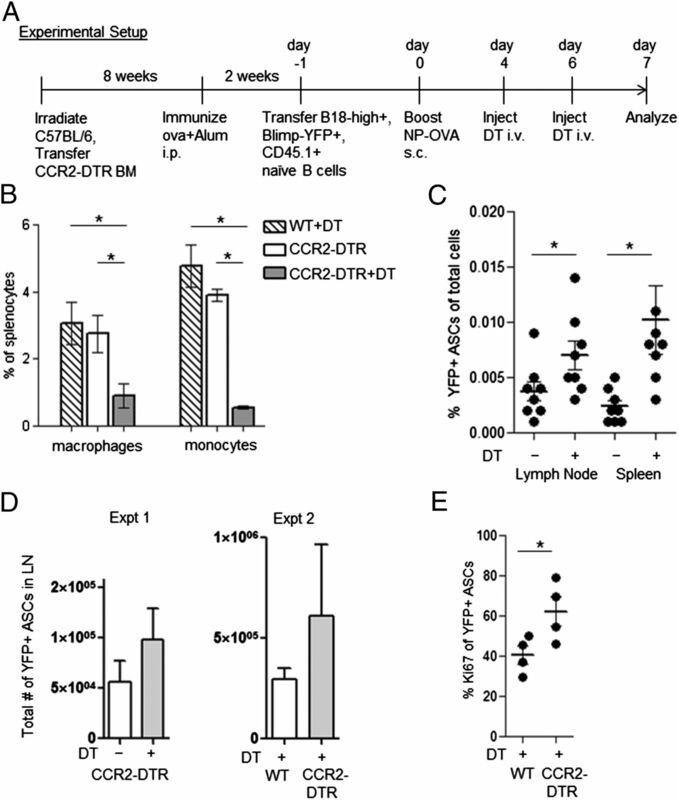 For Ab depletion of monocytes and neutrophils with anti–Gr-1, mice received high–dose RB6-8c5 Ab (i.v. injection with 300 μg) on days 4 and 6 after boost. For imaging experiments, mice received s.c. injection of NP-OVA Ag (50 μg/mouse in 50 μL) into the footpads to target the popliteal LN. Mice were imaged on day 7 after boost using techniques described previously (3). On day 6, fluorescent (CFP+ or td-Tomato+) polyclonal purified naive B cells were transferred as controls for migration or cell contacts. For experiments with chimeric animals, recipient C57BL/6 mice were irradiated once with 900 rad. BM mononuclear cells were harvested from donor mice, and RBCs were removed and washed in PBS and transferred i.v. (∼300,000 cells/mouse) into recipients. Mice were used after 8 wk in experiments, following similar immunization and transfer protocols as described for other recipients. All experiments were approved by Institutional Animal Care and Use Committee. Standard commercially available Abs from eBioscience, BioLegend, or BD Biosciences for flow cytometry were titrated for concentration (typically at 50 ng/ml final) and used for cell staining in PBS with 0.5% BSA and 0.5 mM EDTA for 30 min at 4°C. Flow cytometry data were collected on LSRII or FACSCalibur in the New York University cytometry core facility and analyzed using Flowjo software. For ELISA measurements, NP–keyhole limpet hemocyanin was titrated and used as capture Ag at 2 μg/ml. Serum samples were diluted to 1:1000 and further diluted by serial dilutions on the plate. Purified NP-specific Ab, 9T13, was used as control and to generate a standard curve for concentration. Anti-mouse IgG HRP (Bio-Rad) was used for detection (at 1:5000 dilutions) in conjunction with tetramethylbenzidine substrate and measured using an absorbance plate reader. To calculate cells in contact (Figs. 1B, 2D), time-lapse movies were analyzed by Volocity (Perkin-Elmer) at start, end, and middle time points, and the results were averaged. Fluorescently labeled cells (CFP+, GFP+, and YFP+) were distinguished on the basis of colocalization between channels based on two-channel raw data using CFP and YFP filter settings. By this method of cell detection, cell–cell overlaps are eliminated. The cell volume for PCs and naive B cells was automatically and equally increased using the dilate function, to evaluate neighboring cells in contact. B cells in contacts with GFP+ were quantified as a frequency of total B cell population. Calculations for the distance between ASCs and naive B cells with LysM-GFP+ cells were conducted using Imaris (Bitplane). Briefly, the GFP+ cells were converted into a single surface using the surface feature; naive and ASCs were captured using the ball feature to determine the cell centroid. The distance between the GFP+ surface and cell centroids was converted into a distance channel using a matlab plugin function, and used to compute a cumulative frequency distribution for the cells to the nearest GFP+ neighbor. For depletion experiments, cohorts of four or more mice were used per condition in multiple experiments. In some cases, to improve the power of statistical comparisons, independent experiments were pooled together by normalizing the values to the average for the control condition, and the values were scaled accordingly. We wanted to determine what cells are in direct and stable contact with ASCs to assess their potential role in regulating ASC migration and differentiation. Previous studies using fixed tissues cannot resolve which contacts are stable and which are transient. Therefore, we used time-lapse intravital two-photon microscopy to visualize ASCs in the LN medullary cords of live anesthetized mice. As before (3), we induced Ag-specific ASCs by transferring NP-specific gene-targeted naive B cells (B18-high) from mice also containing a bacterial artificial chromosome containing a transgene in which YFP is expressed using Prdm1 regulatory sequences (Blimp1-YFP), and immunizing the mice with NP-OVA Ag targeted to the popliteal LN and imaging on day 7 at the peak of the ASC response (Fig. 1A, details in Materials and Methods). To visualize and assess potential niche cells in the medullary cords, we tested a variety of congenic fluorescent reporter strain mice as recipient mice. The most promising of these was a mouse stain in which GFP was produced in cells based on the Lysmd1 promoter expression (LysM-GFP) (5). These mice express GFP in cells of the myelomonocytic lineage, including neutrophils, monocytes, macrophages, and DCs. 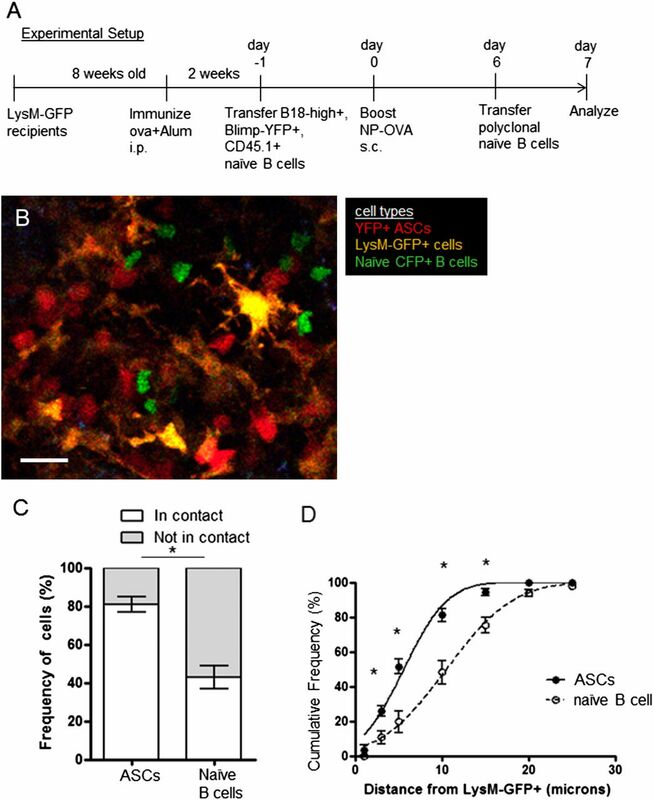 In the medullary cords, Blimp1-YFP+ ASCs were in close contact with LysM-GFP+ cells, whereas naive cyan fluorescent protein (CFP)–expressing B cells were not interacting as closely or as stably with GFP+ cells (Fig. 1B–D). Migrating ASCs moved along a GFP+ cell network, and arrested ASCs were always found to be in contact with GFP+ cells (Supplemental Video 1). In some cases, we observed GFP+ and YFP+ cells tugging on each other actively. We did not observe a similar interaction between polyclonal CFP+ naive B cells with GFP+ myelomonocytic cells, which migrate rapidly in the medullary cords, as previously described (3). ASCs contact myelomonocytic cells in the medullary cords. (A) Diagrammatic representation of experimental setup for imaging ASCs in LysM-GFP+ recipients. (B) Still image taken from intravital time-lapse imaging showing NP-specific Blimp-1-YFP+ ASCs (red) and polyclonal CFP+ naive B cells (green) in contact with LysM-GFP+ (yellow) cells in the medullary cords of the popliteal LN. (C) Based on image analysis (see Materials and Methods), the fraction of ASCs in contact with LysM-GFP+ cells is higher than the fraction of naive B cells in contact LysM-GFP+ cells. (D) The distance between naive B cells or ASCs with the nearest LysM-GFP+ cell is plotted as a cumulative frequency histogram. Cell quantitation is based on a single time-lapse video, but analysis was repeated three times with additional mice. Error bars reflect SD. Scale bar, 20 μm. *p < 0.05. To determine whether these interactions had any physiological effect on ASCs in the LN, we attempted to ablate various subpopulations of LysM-GFP+ cells. Various cell populations are GFP+ throughout the LN particularly in the medullary cords (Fig. 2A), and at differing expression levels (Fig. 2B). Based on our imaging experiments, it was clear that the cells in question had an intermediate GFP expression level (Fig. 2C, 2D) corresponding to various myeloid cell types, including monocytes, macrophages, and DCs. 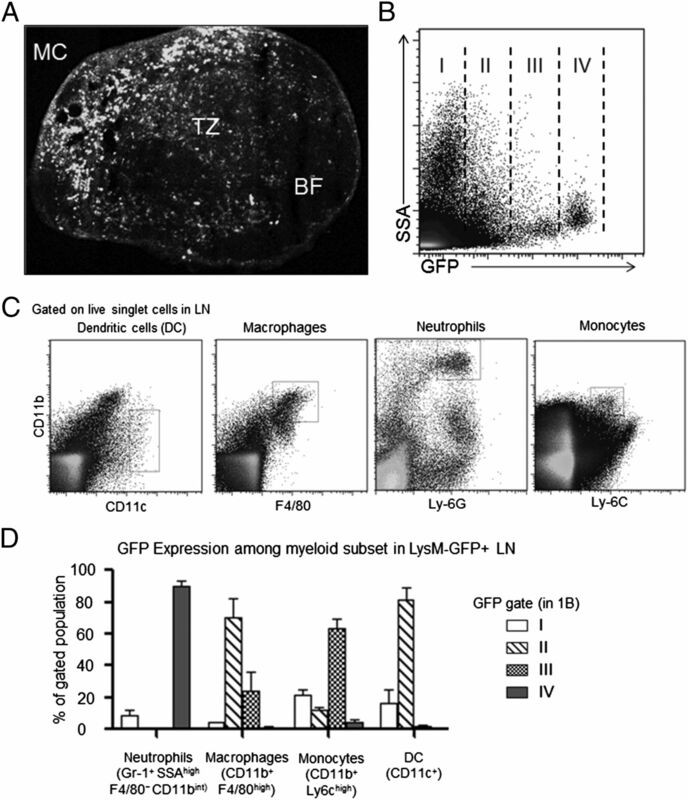 Various myeloid subsets are LysM-GFP+ in the LN. (A) Tiled image of LysM-GFP+ popliteal LN by two photon microscopy with GFP cells throughout the organ, with medullary cords (MC), T cell zone (TZ), and B cell follicle (BF) labeled. (B) Dot plot of cells from the LN, highlighting several distinct populations of GFP+ cells based on intensity (I, II, III, IV). Gating strategy for DCs (CD11c+), macrophages (F4/80+ CD11b+), neutrophils (Ly-6Ghigh CD11b+), and monocytes (CD11b+ Ly6chigh) in the LN (C). These populations in the LN of LysM-GFP were classified by their GFP expression pattern based on the gates in (B), quantified in (D) (n = 3 mice). To target LysM-GFP+ cells for depletion, we bred mice to express a LysM-driven cre recombinase transgene allele with two LoxP cleavage sites flanking a stop cassette, followed by a human DTR, so-called inducible DTR, to generate a DTR on LysM-expressing cells, or simply, a LysM-DTR mouse. This approach has been used to deplete macrophages and monocytes previously (6). Treatment of these mice with DT eliminated a variety of cell types, including F4/80+ macrophages, and Ly-6c+ monocytes in the LN and spleen (Fig. 3A). After B cell transfer and boost to generate ASCs targeted to the draining LN (as described in Materials and Methods), depletion of LysM-cre+ cells by DT treatment on days 4 and 6 increased the number of NP-specific YFP+ ASCs in the LN by 2-fold compared with untreated mice (Fig. 3B–D) on day 7. We measured NP-specific Ab production by indirect ELISA, with or without DT treatment, and found increased Ab titers in treated mice compared with untreated mice (Fig. 3E). This was consistent with increased numbers of NP-specific ASCs. To see how long lasting the effects of acute myeloid depletion were, we measured ASC numbers and serum titers at 14 and 28 d after immunization. At day 14 d, the mice treated with DT had increased ASC numbers in the spleen and anti-NP serum, but by day 28 we saw no difference in treated versus untreated mice (Fig. 3F, 3G), possibly due to repopulation of the myeloid compartment or limited capacity in the ASC niche. By 4 wk, we detected very few ASCs remaining in the LN, which is not a niche for long-lived ASCs (1, 2). To determine whether the depleted cells were the same GFP+ cells engaged with ASCs in the medullary cords, we crossed the LysM-DTR allele combination with the LysM-GFP allele. Indeed, after DT treatment, fewer GFP+ cells were present in the LN and ASCs were less associated with GFP+ cells in the medullary cords after depletion (Fig. 3H–J). 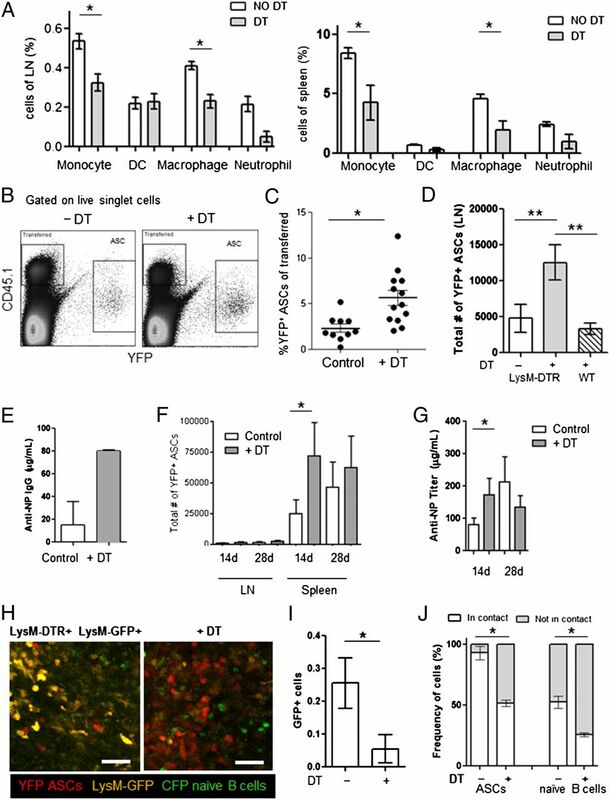 Depletion of LysM-cre+-expressing cells increases ASCs in the LN. (A) LysM-DTR (CD45.2+) recipient mice were preimmunized with OVA, transferred B1-8high+/− Blimp-1YFP+ (CD45.1+) naive B cells, and boosted with NP-OVA by s.c. injection. Bar graphs showing percentage of monocytes, macrophages, DCs, and neutrophils in LysM-DTR LN and spleen from n = 3 mice on day 7 after boost, with or without DT treatment on days 4 and 6. Gates are based on Fig. 2C gates for myeloid subsets. (B) A representative dot plot of YFP+ ASC in the LN with or without DT treatment. Cell numbers were pooled and quantified from multiple experiments as a percentage of the transferred population (CD45.1+) of cells in the LN (C) or as the total number of YFP+ ASCs in the LN (D), with WT recipients with DT shown as additional controls. In (E), NP-specific Ab was measured in serum on day 7 after boost with or without DT, based on two experiments, n = 6/condition total. Ab concentration was calculated based on standard curve using purified NP-specific mAb (9T13). (F and G) WT mice lethally irradiated and reconstituted with LysM-DTR BM for 8 wk were used as recipients similar to experiments shown in (B)–(E), treated with or without DT on days 4 and 6 after boost, n = 10 mice/condition, pooled from two independent experiments. Total number of YFP+ ASCs on days 14 and 28 in the LN and spleen is shown (F). The NP-specific serum titer was measured on days 14 and 28 for mice treated with or without DT (G). As in Fig. 1, intravital imaging of YFP+ ASCs (red), naive B cells (green), and LysM-GFP+ cells (yellow) in the medullary cords of LysM-GFP+ LysM-DTR+ recipients, with or without DT treatment (H). The fraction of GFP+ cells in the LN+/− DT treatment, measured by flow cytometry in (I). Quantification of contacts between ASCs or naive with GFP+ cells is shown in (J). Imaging experiments were conducted twice. Errors bars indicate SE. Scale bar, 33 μm. *p < 0.05, **p < 0.01 for t tests. Increases in ASCs in the LN after myeloid cell depletion could be the result of many potential mechanisms. The most simple and direct possibilities we examined were that ASC numbers could be higher due to more differentiation or proliferation, less cell death, or less egress from the LN. Because ASC numbers were also increased in the spleen after DT treatment, we ruled out changes in migration as a possibility (Fig. 4A). ASCs, particularly those generated early in the response, are known to undergo apoptosis in the LN, on days 7 and onward (7). Annexin V staining for apoptotic YFP+ ASCs showed no decrease in response to myeloid cell depletion (Fig. 4B). The frequency of germinal center B cells in the transferred cell population was similar in treated and untreated conditions (Fig. 4C), suggesting the precursors of ASC differentiation were unaffected. However, we detected more cell proliferation in YFP+ ASCs in the DT-treated mice versus controls (Fig. 4D, 4E) based on Ki-67 staining (8). Increases in ASCs after LysM-DTR depletion are largely due to enhanced proliferation rather than other factors. (A) Experimental setup as in Fig. 2. The population of YFP+ ASCs in LysM-DTR mice is higher in LN and spleen but not BM as compared with C57BL/6, when treated with DT. (B) Quantification of apoptotic marker, annexin V, on the surface of YFP+ ASCs in the LN was similar in LysM-DTR mice with or without DT. (C) Assessment of Fas+GL7+ germinal center cells, gated on CD45.1+ CD19+ transferred B cells in LysM-DTR mice with or without DT treatment. (D) Results are from a single experiment that was repeated twice with n = 3–4 per condition in each experiment. Measuring proliferation based on mitotic marker, Ki-67, on YFP+ ASCs with or without depletion. Two experiments shown separately in (D), and pooled and normalized to control mice (without depletion) in (E). Error bars reflect SD. *p < 0.05 for standard Student t test. **p < 0.05 for a one-sided t test, Welch’s test. To confirm our results in the LysM-DTR model, we attempted to deplete similar myeloid cells using a CCR2-DTR transgenic mouse model (9). Myeloid cells that are recruited from the spleen or BM express CCR2, which include monocytes, macrophages, and DCs. We generated chimeric mice using CCR2-DTR BM as donors cells (Fig. 5A). After reconstitution, we followed a similar transfer, immunization, and depletion strategy as before for LysM-DTR system. Treatment with DT depleted various CCR2+ cell types, including Ly6c+ CD11b+ monocytes, F4/80+ CD11b+ macrophage populations, and other myeloid populations (Fig. 5B), while increasing frequency of ASCs in the transferred cell population in the LN and spleen as compared with controls (Fig. 5C, 5D). In addition, more ASCs in the LN expressed elevated Ki-67+ levels compared with controls (Fig. 5E). These results were similar to those obtained using the LysM-DTR model. 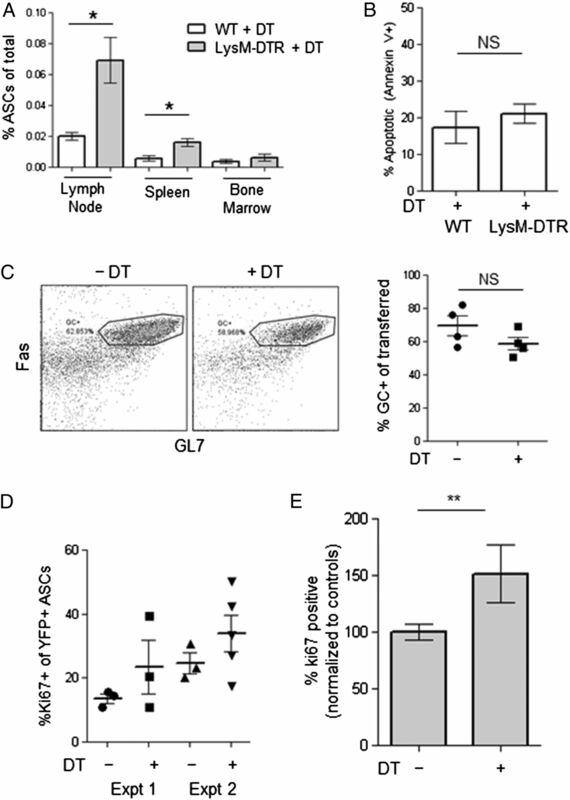 Depletion of myeloid cells by CCR2-DTR increases ASC numbers in the LN. (A) Experimental setup described. (B) Systemic myeloid depletion in CCR2-DTR mice after DT treatment was assessed in the spleen, compared with untreated CCR2-DTR chimeric mice and C57BL/6 mice as controls. Quantitation of percentage of macrophage (F4/80+ CD11b+) and monocyte (CD11b+ Ly6c+) subsets, as in Fig. 2C (n = 4 or more mice/condition). (C) Assessment of YFP+ ASCs in the LN spleen with or without DT treatment, pooled from two independent experiments (n = 8 mice/condition), also shown as total number of YFP+ ASCs in the LN for two independent experiments in (D). (E) Proliferation of YFP+ ASCs was assessed by Ki-67+ staining. *p < 0.05 for t tests. By using these depletion techniques, we could deplete myeloid cells and increase ASC responses. However, these strategies are not specific for monocyte, macrophage, or DCs, which is a problem with most approaches (explored in Discussion). Nevertheless, we attempted additional myeloid cell depletion strategies to try to resolve which cells are regulating ASCs. To deplete a subset of monocytes (and neutrophils), we treated mice with a regiment of high doses of Gr-1–specific Ab (Fig. 6A). After depletion, we saw a marked reduction in neutrophils (GFPhigh, Gr-1high) and monocytes (GFPint Gr-1int) in the mouse; however, we saw no effect on Blimp1-YFP+ ASC numbers in the LN, or in ASC migration to spleen and BM compartments (Fig. 6B). Depletion of Gr-1+ myelomonocytic cells or CD11c+ DCs does not alter ASC population. (A) LysM-GFP+ mice were treated with anti–Gr-1 or control (PBS), and the depletion of monocytes (green gate) and neutrophils (red gate) was assessed in the LN and spleen, in representative dot plots. (B) Using transfer/boost model as in Fig. 1A, recipients were treated with IV anti–Gr-1 (300 μg) or PBS on days 4 and 6 after boost. The percentage of YFP+ ASCs in the LN, BM, and spleen was assessed in control versus anti–Gr-1–treated mice. Single representative experiment is shown in (B). (C) CD11c-DTR-ires-GFP BM was used to reconstitute mice as in Fig. 4A. Images of popliteal LN analyzed from CD11c-DTR recipients to assess depletion of GFP+ DCs (in yellow) with or without DT treatment, with YFP+ PCs (red). Original magnification ×20. (D) Quantification of PCs in the LN, spleen, and BM, with or without depletion, pooled. To correct for variability between experiments, values were normalized as a ratio of the raw percentage of ASCs to the average for the control in each experiment, thereby allowing pooling from four independent experiments with different BM chimeras, n = 16 mice per condition total. Next, we used mice expressing human DTR under the CD11c promoter with a GFP reporter (CD11c-DTR), which can deplete DCs and other CD11c+ cell types upon the introduction of DT i.v. To avoid depletion of nonhematopoietic CD11c+ cells (such as endothelial cells), which can lead to early mortality (10), we irradiated wild-type (WT) mice and reconstituted their hematopoietic compartment with CD11c-DTR–derived BM (chimeric CD11c-DTR) to use as recipient mice as in Fig. 5. After reconstitution, B cell transfer, and immunization, mice were treated with DT on days 4 and 6 and analyzed on day 7. We chose to deplete late so as not to interfere in the initial DC-T and B-T interactions, which are critical for PC production. We did not detect any defect in B18-high germinal center B cell numbers as a result of late depletion (data not shown). Upon DT treatment, all of the CD11c-GFP+ were efficiently depleted in the LN; however, the YFP+ cells were still present (Fig. 6C) and their numbers were not different as compared with untreated mice in a statistically significant level (Fig. 6D). We detected a decrease in YFP+ PC numbers in the spleen and BM. Because Ag is targeted to the draining LN, any decreases in YFP+ PCs in the spleen or BM are most likely due to either migration or survival defects, which occur downstream of PC egress from the LN. DCs have been implicated in survival of ASCs in the BM and spleen (11). Signaling through the IL-6 cytokine pathway can enhance Ab secretion and PC differentiation (12), but IL-6 may also dampen B cell responses in lupus-prone mice (13, 14). In these conditions, DCs and macrophages have been shown to secrete IL-6, which reduces B cell responses. We wanted to test whether myeloid cell inhibition of ASC proliferation in the LN involved IL-6 signaling. However, IL-6 plays an important role in various aspects of B cell activation, and many cell types secrete IL-6, including B cells, myeloid cells, and nonhematopoietic follicular DCs (12, 15). 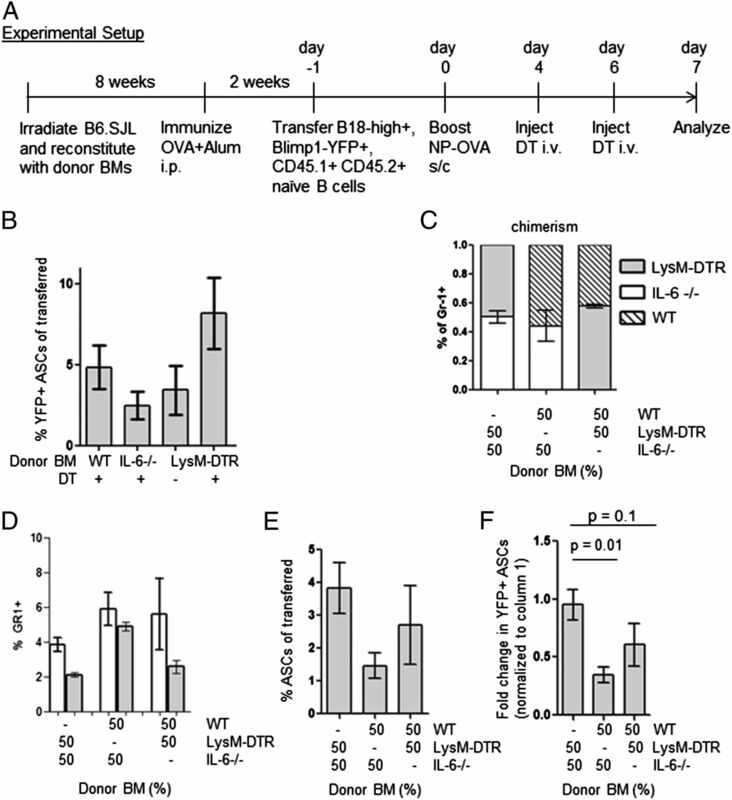 To circumvent this requirement partly, we generated BM chimeras using IL-6–deficient, LysM-DTR, or WT BM into WT CD45.1+ mice to be used as recipients for our transfer and immunization protocol (Fig. 7A). ASC production was reduced in recipients with IL-6−/− hematopoietic cells as compared with WT or LysM-DTR BM, indicating that IL-6 enhanced ASC production (Fig. 7B). To see whether IL-6 signaling was required in myeloid cell inhibition of ASCs, we generated chimeric mice with 50/50 mixtures of donor BM cells from LysM-DTR mice and IL-6−/− mice. In these mice, upon treatment with DT, IL-6–sufficient myeloid cells would be depleted, whereas IL-6–deficient myeloid cells would remain. As controls, we generated 50/50 BM donor cell mixtures of IL-6−/− and WT, or LysM-DTR and WT. We could assess chimerism in the myeloid compartment on the basis of CD45 congenic markers and GFP expression (Fig. 7C). All chimeric mice were treated with DT, but only those that had LysM-DTR BM had reduced levels of Gr-1+ monocytes, as expected (Fig. 7D). Mice with mixtures of LysM-DTR BM with either WT or IL-6−/−-deficient BM had similar ASC production after DT treatment, indicating that the nondepleted population of myeloid cells (LysM-DTR–negative subset) does not require IL-6 production to inhibit ASC generation (Fig. 7E). In contrast, recipients with mixed IL-6−/− and WT BM had impaired ASC production that was similar to mice with IL-6–deficient-only BM, but lower ASC production than in WT mice or mice with mixed IL-6−/− and LysM-DTR+ BM. This suggests that the level of IL-6 production in recipients with mixed WT and IL-6−/− BM is not sufficient to restore WT levels of ASC production. Furthermore, the capacity for myeloid cell depletion to increase ASC numbers can still occur under these reduced IL-6 levels in mixed LysM-DTR, IL-6−/− BM chimera as compared with IL-6−/− WT mixed chimeras. Taken together, IL-6 plays a positive role in ASC production, whereas myeloid cells play a negative role in ASCs. These two effects are unlikely to be involved in the same pathway because we could identify contributions of each pathway when they are combined in the mixed chimera strategies, and we can conclude that IL-6 signaling does not contribute to myeloid cell inhibition of ASCs. IL-6 production is dispensable for myeloid cell regulation of ASCs. (A) Experimental setup diagrammed. (B) Quantification of ASC numbers as a percentage of transferred cells, n = 4 per condition, measured once. (C) Chimerism was assessed by CD45.1/CD45.2 staining of Gr-1+ cells for mixed BM conditions. (D) Depletion of Gr-1+ cells was measured in spleens on day 7, for three mixed BM conditions, shown for a single experiment for (C) and (D), but conducted three times. (E) Quantification of ASC numbers as a percentage of transferred cells. Values are pooled from three experiments, n = 12 per condition in total. To correct for variance between independent experiments with different batches of BM chimeric mice, values in a given experiment were normalized to the average value for mice with BM containing 50:50 LysM-DTR:IL-6−/− (first column), shown in (F). Error bars reflect SE; the p values are for unpaired t test comparison. The PC niche in the medullary cords of LN is a transient microenvironment that is poorly understood. At steady state, ASCs in the LN are very rare, <0.001%. However, during an immune response in the LN, ASCs are 100-fold more abundant, accumulated mainly in the medullary cords. Based on intravital imaging showing a strong cell–cell interaction between ASCs with LysM-GFP+ cells, we expected that these cell–cell contacts promoted ASC survival and function, based on the niche model, previously proposed (4). However, we discovered that macrophages and monocytes serve to dampen ASC proliferation, which ultimately dampens Ab responses. By employing an overlapping set of depletion techniques, we were able to narrow down the potential myeloid cell types that are responsible. We can rule out conventional DCs from any functional role at late stages based on Fig. 6D results. Using the LysM-DTR and CCR2-DTR models, we were able to target monocytes and monocyte-derived macrophages and DCs; however, these techniques are not specific for any given myeloid subset. In contrast, depletion with high-dose anti–Gr-1, which targets Gr-1+ monocytes and neutrophils, had no effect. This left macrophages and Gr-1–negative monocytes, such as CX3CR1+ subset. Because the myeloid cells were providing a dampening effect on ASC numbers and Ab titers, we hypothesize that we are potentially targeting a myeloid-derived suppressor cell. Myeloid-derived suppressor cells are poorly understood, comprised of monocytes, macrophage, and DC subtypes that can inhibit other immune cells (16). Based on our depletion schemes, anti–Gr-1 treatment would spare Gr-1low CX3CR1+ myeloid-derived suppressor cells, which can secrete inhibitory cytokines such as IL-10 and may act to inhibit ASCs. However, further characterization with depletion techniques that target these cell types specifically would be needed to validate this possibility. Regardless the cell, the striking engagement of ASCs by myeloid cells in the medullary cords suggests a new regulatory mechanism that modulates Ab production. Myeloid cells are ideally positioned and concentrated in the medullary cords to provide further regulation and input into the ASC humoral response. Typically, monocytes are recruited in the lymph node during an inflammatory response to provide innate help during an infection. However, in our experiments, which model vaccination with no adjuvant, monocytes may dampen ASC responses in an effort to quell ASC responses that may be unnecessary or potentially directed toward self Ags. These effects seem to be ameliorated over time as new myeloid cells repopulate the lymphoid tissues, based on our time course, and seem to implicate short-lived PBs as the target of regulation. This is consistent with studies that show that macrophages and DCs can inhibit ASC responses in mouse models of lupus (13, 14). However, in those models, IL-6 played a role in signaling to the ASCs. When we tried to block test whether myeloid cells required IL-6 to inhibit ASCs using mixed BM chimeras, we saw no role of IL-6 in these cells. This difference in mechanism may be due to differences in our vaccination model that lacks the inflammation common to the lupus system. In lupus patients, conditions of chronic inflammation produced by myeloid cells lead to PBs that are overrepresented in the blood and in peripheral tissues, including kidney (17, 18). It would be interesting to repeat these experiments using strong adjuvants or an infection model in which inflammation may change the role that myeloid subsets play regulating ASC responses. Based on the tight cell–cell interactions that we observed in the LN, there is also the potential that myeloid cells may also help regulate the balance of ASC egress versus retention in the LN. Although we were not able to measure compensatory changes in cell numbers between LN and spleen, this does not exclude the possibility that myeloid cells trap ASCs in the LN. Myeloid cells increase and decrease in the LN with kinetics that match ASC numbers in the LN. Studies with CD18-deficient mice, with defective LFA-1, demonstrated increased ASC numbers in the LN due to failure to egress (19). Interestingly, these mice also have elevated IL-6 levels in the serum (20). These results may indicate a bidirectional signaling that may occur between ASCs and myeloid cells. Interfering with these contacts may lead to increased inflammation, which could explain the increases in ASC function after myeloid cell depletion. The interplay between these cell types may provide new ways to modulate immune response in both immunization and autoimmune contexts. We thank Eric Pamer for CCR2-DTR mice and the New York University flow cytometry facility for help with collection of cell analysis. This work was supported by National Institutes of Health Grant R01 AI072529. 2011. Staying alive: regulation of plasma cell survival. Trends Immunol. 32: 595–602.
. 2010. Development and migration of plasma cells in the mouse lymph node. Immunity 33: 118–127.
. 2009. Dendritic cells and monocyte/macrophages that create the IL-6/APRIL-rich lymph node microenvironments where plasmablasts mature. J. Immunol. 182: 2113–2123.
. 2000. Insertion of enhanced green fluorescent protein into the lysozyme gene creates mice with green fluorescent granulocytes and macrophages. Blood 96: 719–726.
. 1995. Ki67: from antibody to molecule to understanding? Clin. Mol. Pathol. 48: M113–M117.
. 2009. Inflammatory monocytes facilitate adaptive CD4 T cell responses during respiratory fungal infection. Cell Host Microbe 6: 470–481.
. 2010. Defining dendritic cells by conditional and constitutive cell ablation. Immunol. Rev. 234: 76–89.
. 1995. Interleukin-4 is required for the induction of lung Th2 mucosal immunity. Am. J. Respir. Cell Mol. Biol. 13: 54–59.
. 2008. The regulation of autoreactive B cells during innate immune responses. Immunol. Res. 41: 295–309.
. 2012. Autoreactive preplasma cells break tolerance in the absence of regulation by dendritic cells and macrophages. J. Immunol. 189: 711–720.
. 2009. 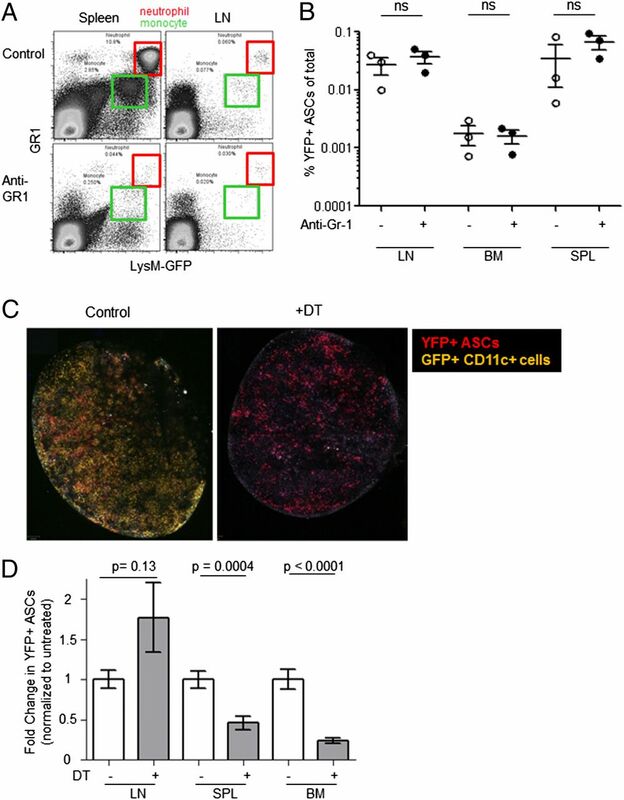 IL-6 produced by immune complex-activated follicular dendritic cells promotes germinal center reactions, IgG responses and somatic hypermutation. Int. Immunol. 21: 745–756.
. 2013. Early differentiated CD138(high) MHCII+ IgG+ plasma cells express CXCR3 and localize into inflamed kidneys of lupus mice. PLoS One 8: e58140.
. 2003. Perturbations of peripheral B lymphocyte homoeostasis in children with systemic lupus erythematosus. Ann. Rheum. Dis. 62: 851–858.
. 2005. Cutting edge: egress of newly generated plasma cells from peripheral lymph nodes depends on beta 2 integrin. J. Immunol. 174: 7492–7495.
. 2006. Terminal B cell differentiation is skewed by deregulated interleukin-6 secretion in beta2 integrin-deficient mice. J. Leukoc. Biol. 80: 599–607.